Before I moved to Paris, my only experience with goat cheese was those small white logs of pasteurized cream cheese-like stuff, hermetically sealed in a thick, clear plastic casing, with annoying plastic green leaves pressed along the sides. Thankfully in France there are somewhere around 400 different types of cheese, so one can only assume a large number of those are chèvre. The Frenchies seem to be crazy for chèvre, and so am I. Nearly every time I go out to lunch with a Parisienne (female), one of us orders a salade de chèvre. As everyone in Paris (male or female) is concerned about their weight, somehow the goat cheese salad has become a mythical weight loss entrée for at least the women. (Calorie-wise, I’m not so sure.) Calorie count or not, all those French goats and their delicious cheese, make it very easy to add salade de chèvre to my list of 365-things-I-love-about-France. There are two main goat cheese salads in France: salade de chèvre chaud and salade de chèvre chaud croustillant. My favorite is croustillant, but the main thing is to make sure it is chaud (warm). There is something about the contrast of the warm cheese with the cold salad greens that knocks the socks right off my tastebuds. On a simple salade de chèvre chaud the cheese is usually served crouton-style on thin, toasted slices of baguette. On the more decadent salade de chèvre chaud croustillant, the goat cheese comes wrapped in phyllo dough with a slight hint of honey and rosemary. Heavenly! Here’s an anglicized recipe from Mademoiselle Slimalicious (one of my new favorite blogs, written by a French expatriate in Australia). Bon appétit! 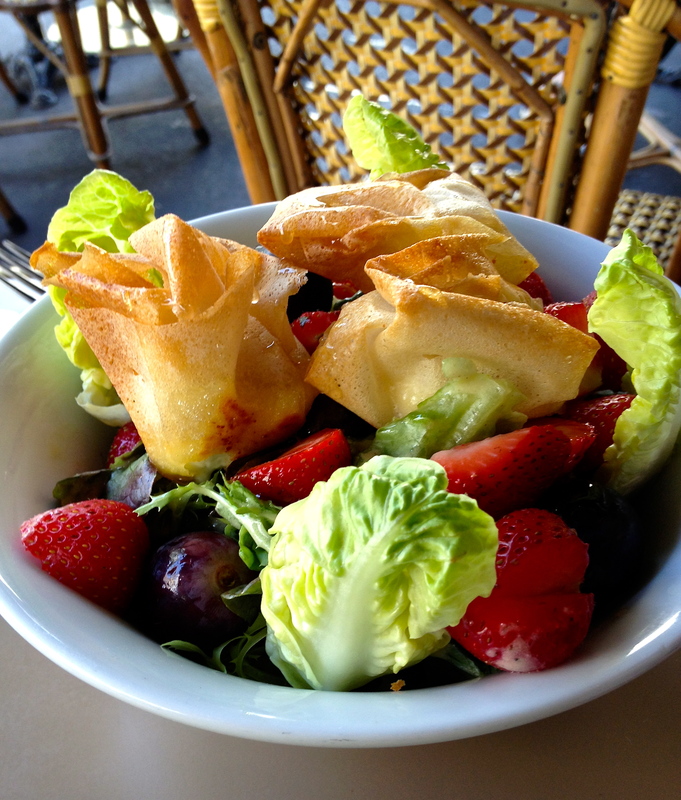 I will have to return to the City of Light to try this salad! Thanks! I took it on rue Mouffetard at a little café with Kitcat before she left for college. It is definitely our favorite French salad. You linked a recipe but honestly the salad from your picture looks way more delicious. Do you remember what was in it? I can see the toasted cheese, strawberries, lettuce, grapes or are those black olives? Thanks! Hi there. Yes. This was a particularly yummy chèvre salade I had on rue Mouffetard in Paris. I tend to like my chèvre salads a little more fruity with the savory melted chèvre. The key is the honey and rosemary and chèvre wrapped in the filo pastry and served croustillant: crispy, crusty. This was a summertime version and it had strawberries, grapes and lettuce, c’est tout. It was delicious. Thanks for the comment.